When Buddha Bar opened in Paris in 1996 it took the city by storm. A visionary ultra-chic designer restaurant, bar and lounge serving contemporary fusion Asian food to the stylish set, the blend of East meets West set a new trend in design unseen elsewhere before. Since that illustrious opening, the Buddha Bar brand has gone global with restaurants and bars throughout the world. The brand has also extended to hotels, resorts and spas, as well as downloads of the funky DJ tunes played in its venues. The London branch of Buddha Bar is located in the equally chic Knightsbridge, and is headed by Chef King Dey who spent three years at L’Etranger as the Head Chef and has also freelanced at Noma and Zuma. As such there are little twists in the contemporary Japanese-centric menu which places a strong focus on maki rolls, sushi and sashimi. The current location is much smaller than the previous Buddha Bar at Temple. But it’s undeniably a Buddha Bar with its trademark look of chic and a classy clientele. 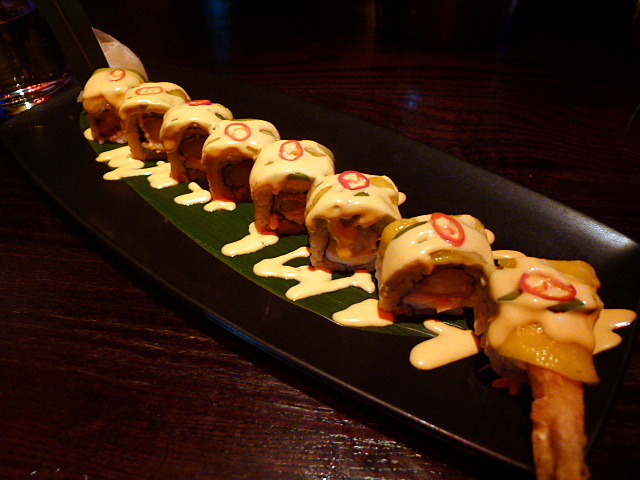 A king crab and prawn tempura roll (8 pieces – £17.50) was gratifyingly tasty from the sweetness of the seafood. But the tempura batter was a bit soft, and a crunchier finish would have given it a greater textural contrast. The spicy mango sauce was sweet and tangy and a perfect fit for the roll. 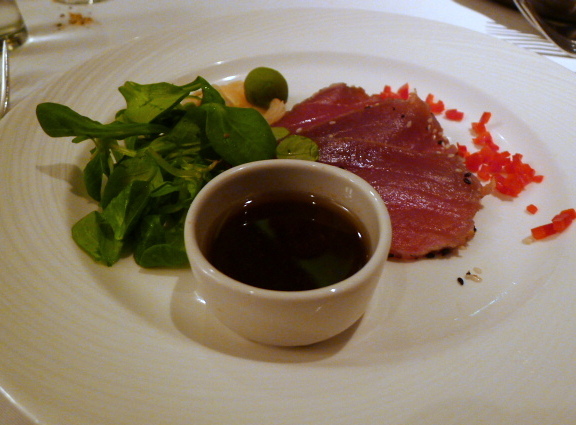 Note: Ametsa was awarded a Michelin Star in September 2013. As the name suggests, Ametsa by Arzak Instruction draws its culinary inspiration from the famous three-Michelin starred Arzak in San Sebastian, Spain. Arzak made its name by introducing Nouvelle Basque cooking to the world. By taking the traditions of this fine food region and overlaying it with an inspired modern touch, the imagination of Arzak caught the world’s attention. 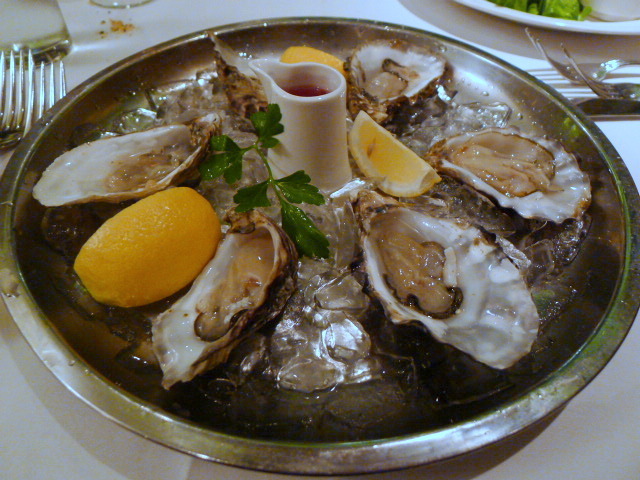 In 1989 it attained its three-Michelin star status, an accolade that it continues to hold to this day. 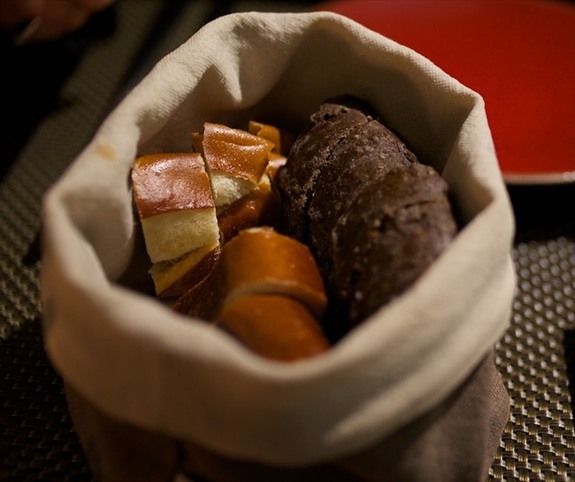 And so it is that the philosophy behind Ametsa is also one of ‘New Basque Cuisine’, a matching of the traditions of the Basque region with modern techniques. 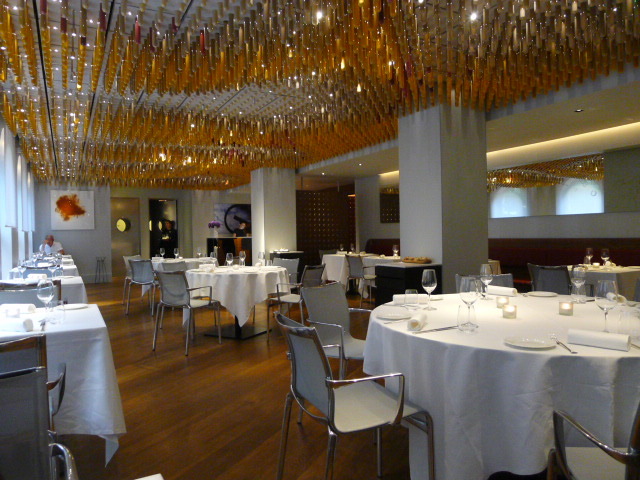 It opened in March 2013 at the Halkin Hotel, taking over the space that was once occupied by David Thompson’s Nahm. A quintet of chefs from Arzak consulted on Ametsa including Mikel Sorazu, Igor Zalakain and Xabier Gutierrez, and most notably the famous father and daughter pair of Juan Mari Arzak and Elena Arzak who was recognised by the World’s 50 Best Restaurant Awards as the World’s Best Female Chef of 2012. No expense was spared on the interior and it looks expensive. The most eye-catching aspect of Ametsa’s décor is the ceiling that was created from 7,000 dangling glass receptacles filled with spices. It’s impressive, but the overall feel of the restaurant is quite cold with whitewashed walls and furnishings that give it a rather stark effect. In some respects, it was difficult to warm to the atmosphere of the restaurant. A Wong is the latest ‘buzz’ Chinese restaurant in London at the moment and is the baby of chef Andrew Wong who has studied in kitchens throughout China. But Chef Wong already came from restaurant stock for his father use to run Kym’s, the Chinese restaurant that previously occupied the same space as A Wong. Basically Andrew has taken on the same address as his own and refurbished it with a more minimalist taste. The result is a restaurant with shiny surfaces and none of the Chinese chintz. Not that there is anything wrong with Chinese chintz, but this style is much more in keeping with Western ‘cool’. Chef Wong’s solid bio shows in his menu with a diverse range of dishes drawn from throughout China. During the day he serves dim sum from Hong Kong, and in the evenings the a la carte menu includes touches of the Sichuanese, etc. The pricing of the menu is also fabulously cheap, something of a bonus in this day and age. 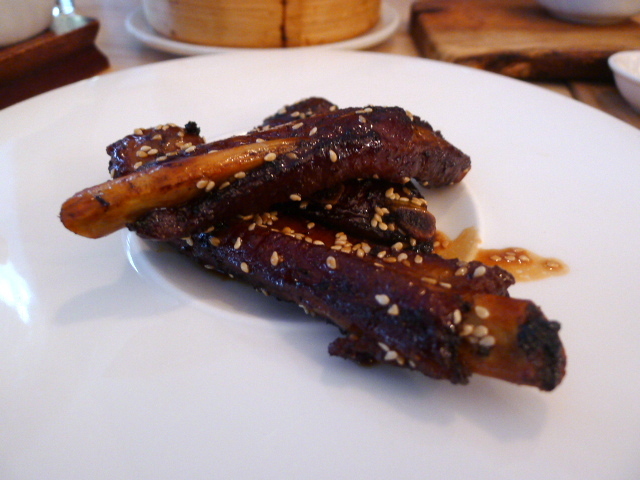 To the starters and sweet and sour ribs (£1.50 each) were tasty if a little overcooked leaving the outer layer of the rib a bit dry. The sauce was well made and had a lovely sticky, sweet quality to it that was delicious. One-O-One Restaurant situated at 101 (yes) Knightsbridge is merely a stone’s throw away from the glamorous retail shops of Knightsbridge. Specialising in seafood, it probably has the unfortunate distinction of having one of the ugliest restaurant frontages in London. It’s attached to the Sheraton Park Towers, a monstrosity of a grey building that dates back to the 1970s. The interior of the restaurant fares better than its exterior but is quite formal and somewhat soulless. But what is attractive about the restaurant is that it has received a variety of accolades including recognition as the Fifth Best Restaurant in Great Britain in The 2012 Sunday Times’ Food List. Also attractive about One-O-One is that it seems to regularly offer discounts through TopTable that makes a dining experience at the restaurant much more affordable as their prices are high. Starters range between £11 and £28 and mains between £28 and £39. My booking provided for a fabulous 40% off, but I pity the poor tourist souls who stay at the hotel and have no knowledge of this insider’s tip and simply walk into the restaurant to pay full price. 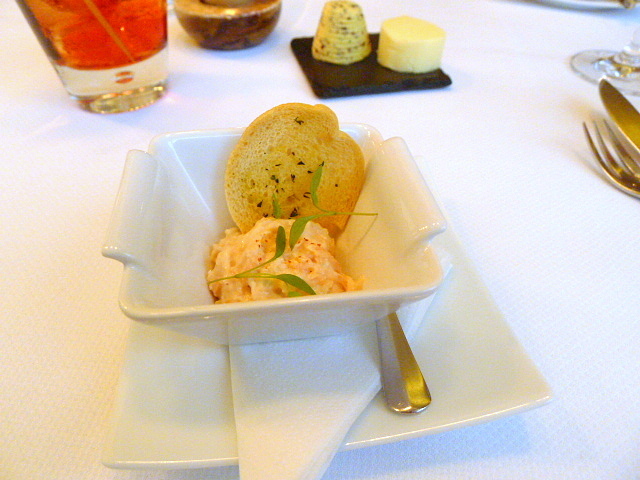 The meal kicked off with an amuse bouche of salmon rillette with croutons that was very good. 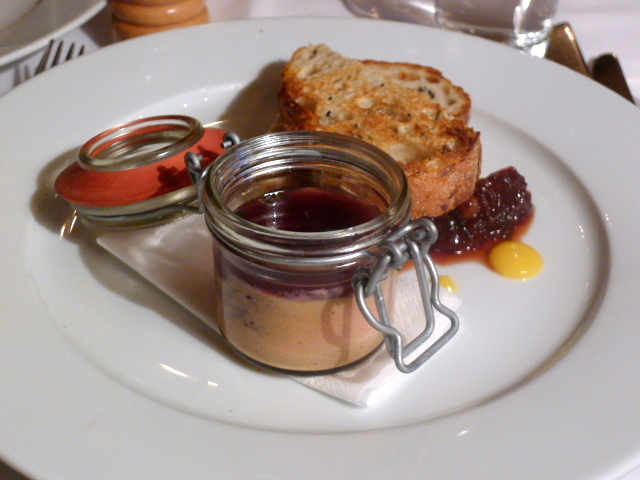 The rillette was pleasant with a nice salmon flavour and nicely creamy. The same people behind The Thomas Cubitt in Belgravia have produced another charming rendition of a public house with The Grazing Goat. Situated on New Quebec Street just off Portman Square, The Grazing Goat is more than just a pub serving an interesting array of beers, wines and cocktails. The first floor also plays home to the restaurant, and on the floors above there is a hotel with eight guest rooms. It was to the restaurant that we went – a delectable dining room furnished in the vein of a posh gastropub with blond oak panelling and soft muted lighting. The overall effect was a charming ambience that made you feel right at home. 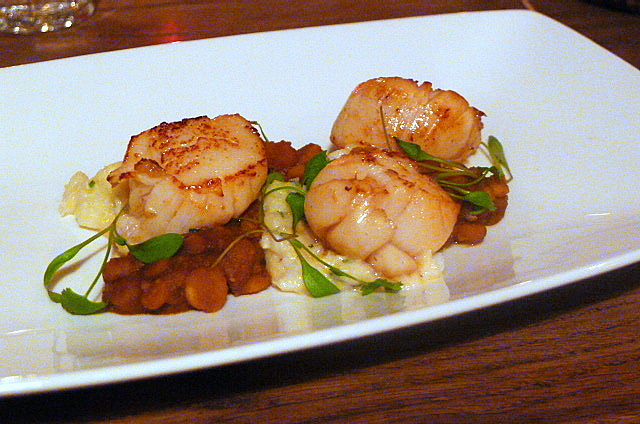 A starter of seared Scottish scallops (£11) was tasty and nicely cooked, with accompaniments including a salt cod and herb potato purée and some citrus lentils. The purée was smooth and pleasant, but you couldn’t really taste the herbs, and the lentils were very acidic. The result was that the saltiness of the cod purée and the acidity of the lentils overpowered the gentle flavour of the scallops. This dish lacked for balance and needed something more delicate to make it work.